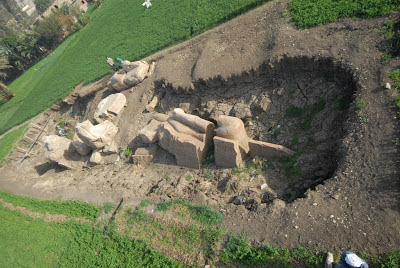 The Minister referred that those two statues are considered the largest of Amenhotep III. Each of the limestone statues are of 14 meters high, based on 4 meters high base. The statues represented the King standing at the northern entrances of the temple. 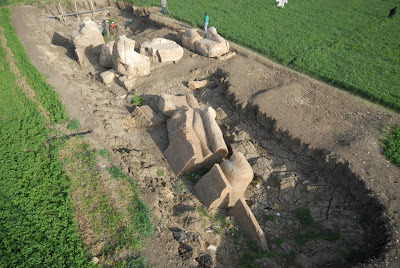 They were discovered in 1933 then re-discovered in 2010 and recently they were submerged in irrigation water in the agriculture area where also a water pipe exploded which exposed them to great danger and required a quick intervention to safe and move the statues. The Minister said that the moving process will take a week from now and this event will help in returning tourism to Egypt and Luxor in particular. Dr. Mohamed Abd El Maqsoud, Deputy Head of the Egyptian Antiquities department and the head of the team, said that the moving project is considered the biggest ongoing projects in Luxor at the moment. A German team participating in the project which is funded by the German side to move the statues 60 meters to make sure they are safe then the restoration project will start which will include rejoining more than 20 blocks to the statues. There are inscriptions on the base of one of the statues in addition to the back of the statue which bears the name of the King whilst the other statue shows the King wearing the white crown of the South. The second statue is in better condition and no fractures on the face.